What was your first experience as a volunteer like? 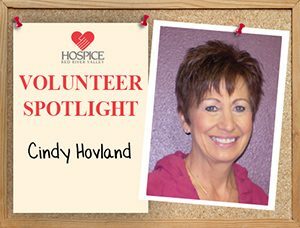 Initially, I had no idea what being a volunteer with Hospice would entail. The first patient I visited lived in her own home. At first, I thought it might be uncomfortable during the first visit, but I soon formed a very comfortable relationship with her. After realizing she had very bad eyesight, I spoke to Hospice staff about visiting her every day. I wanted to read her the local newspaper since she couldn’t do that for herself. Why do you continue volunteering? I have met the neatest people through Hospice, and I just don’t want anyone to feel alone. I also volunteer as a Pathway volunteer, staying the bedside of patients who are in their last days of life. It doesn’t matter what time of day or night, I want to be there to help. I’m happy I’m able to be there for patients during such a sacred time, especially if family and friends are unable to be there. In my free time, I enjoy traveling with my husband of 42 years, Keith. We have 10 grandchildren that also keep us busy. Four grandchildren live locally, and the other six grandchildren live in southern Minnesota. I also enjoy designing arrangements at a local flower shop.